Otokoyama is one of Asahikawa's most famous local sake brewers. If you go to any popular Japanese restaurant in your home town, you will always see it offered as the finest sake from Japan. Otokoyama sake brewery is located in Nagayama, in the northern suburbs of Asahikawa and if you continue past it heading north, you will find Otokoyama Nature Park at the top of the hill. The park is made up of a web of narrow paths with slight gradients making it ideal for those looking for a quiet hike in beautiful scenery. 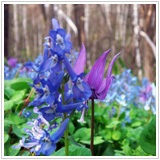 The variety of flowers is a treat for photographers and nature lovers. 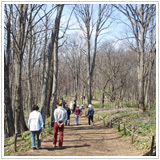 The park is most popular during the spring at which time visitors flock to the park to view Hokkaido's largest natural garden of Dog Toothed Violets (Katakuri). 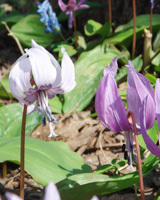 Definitely worth seeing if you are in Asahikawa in spring. Drive Route 40 to north. Turn left 100 meters before the first tunnel then right at the old tunnel enterance.